The decision to move your loved one into a Long-Term Care home is never an easy one, which is why it is so important to ensure you are making the best possible choice. Accreditation is important because it helps to create higher quality health care and social programs. Choosing an accredited Long-Term Care residence, like those in the Park Place family, means you can be sure that we will continue to focus on innovation and improvement to enhance the quality and safety of care we provide for your loved one. Health care accreditation is an ongoing process of assessing the health care and social services that organizations provide against standards of excellence, to identify what is being done well and identify opportunities for improvement. Accreditation Canada was established in 1958, as an independent, non-profit, voluntary accrediting body for the health care industry. Accreditation Canada is used by health care organizations across Canada and internationally as an independent measure for quality of care. When granted, the Accreditation Canada logo identifies health care organizations which have met national standards and utilize best practices in health care. To earn accreditation, health care organizations must pass a rigorous and detailed in-person examination by an external, independent survey team of industry professionals. This process must be repeated every three years. 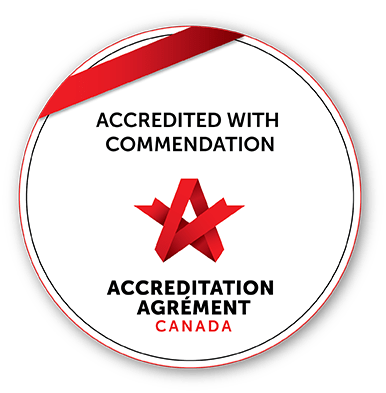 Park Place Seniors Living has completed Accreditation Canada’s operational reviews in 2005, 2008, 2011, 2014 and 2018. Each time, we have earned full accreditation for the quality care we provide our clients. One of our proudest moments came in May 2005, when Park Place was nationally accredited by the Canadian Council on Health Services Accreditation. This recognition is important to us as it allows us to know that, even as we grow, we still provide the very best in care and service at our care homes. Our care philosophy - a promise to our residents that they will be cared for as an individual, with the right to a “voice and choice” in their own care. A music program to calm residents suffering agitation due to cognitive impairment. A focus on integrating residents within their community. Caregivers, family members and volunteers work to provide items to make residents feel more at home in their new environment. Integrating ethics into our working environment helps everyone make choices that benefit our residents. Are all Park Place residences accredited? Accreditation is only available for homes which include nursing care. All Long-Term Care homes owned and operated by Park Place Seniors Living have completed the accreditation process. Our residences offering Independent and Supportive Living only do not qualify for an Accreditation Canada review.